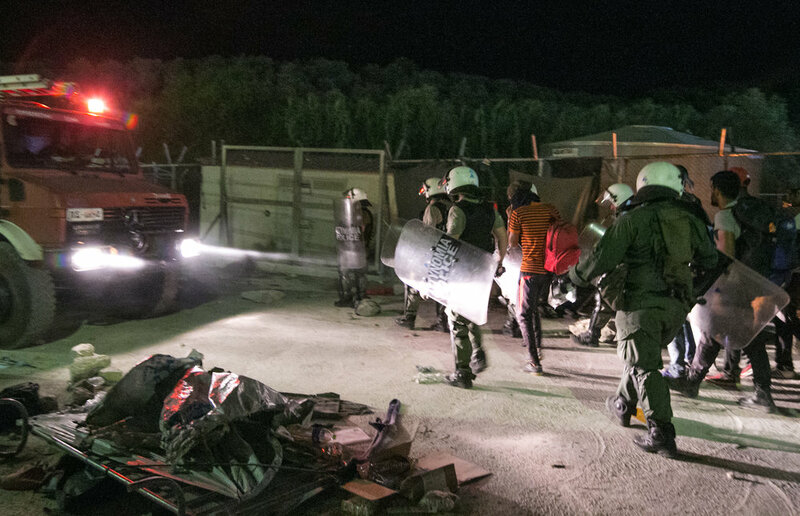 Migrants and police look on as one of the largest camps in Lesvos burns to the ground. The violence began early this morning with small incidents of rock throwing and trash burning, but quickly worsened as the day went on. According to several South African refugees, the massive blaze was started due to a conflict between a group of Afghans and the police. The animosity amongst neighboring ethnicities was also said to be a factor. You can't put these men who's countries hate each other in the same camps. It just doesn't work," said Moria resident Mike Abdule. The destruction displaced thousands of migrants who can now be found sleeping on the side of the road, the beach, or in what's left of their charred campsite. 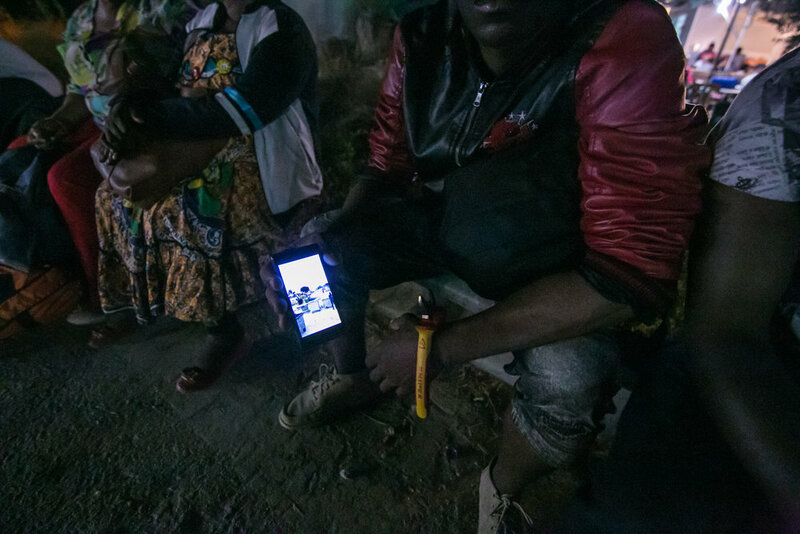 A Nigerian migrant shows me a video of Afghans allegedly throwing rocks at police. "This is how it started," he explained. 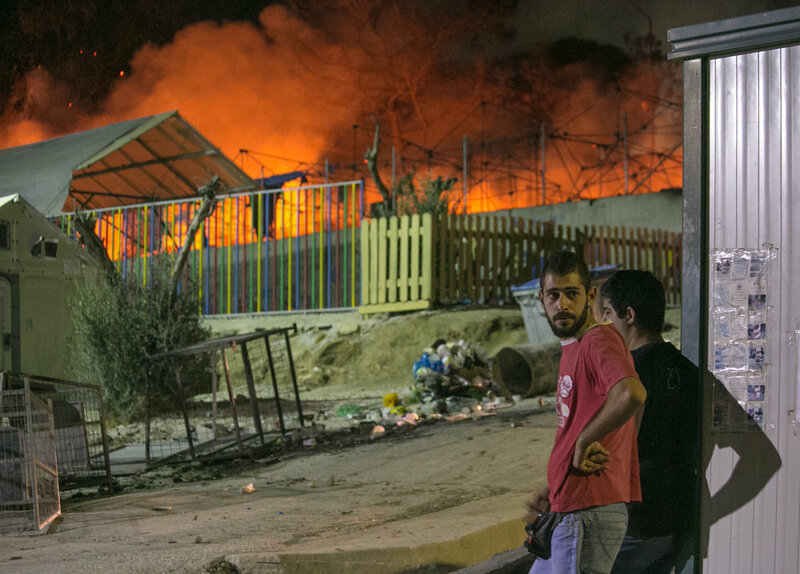 A young refugee looks on as one of the largest camps in Lesvos burns to the ground. 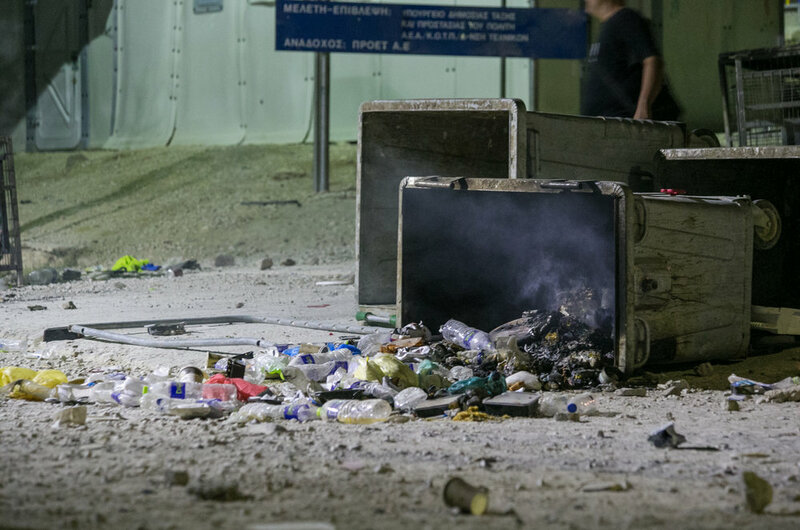 The violence began early this morning with small incidents of rock throwing and trash burning, but quickly worsened as the day went on. According to several South African refugees, the massive blaze was started due to a conflict between a group of Afghans and the police. The animosity amongst neighboring ethnicities was also said to be a factor. You can't put these men who's countries hate each other in the same camps. It just doesn't work," said Moria resident Mike Abdule. The destruction displaced thousands of migrants who can now be found sleeping on the side of the road, the beach, or in what's left of their charred campsite. A fire truck pulls into the camp as the blaze continues to rip through rows of tents. 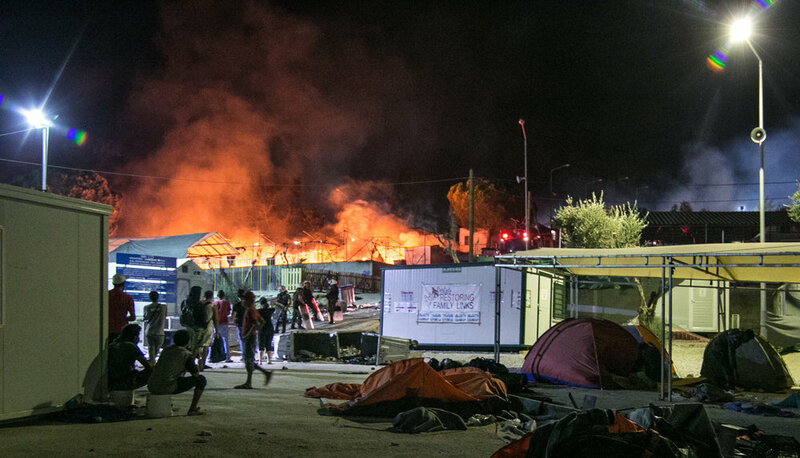 Due to fighting amongst police and migrants, the fire trucks could not make it into the camp until the flames had spread out of control. "They just sat out there. They just let it burn," one Nigerian migrant explained. Greek Police pull Moria residents off of a volunteers car. The residents punched and kicked the hood, windows, and doors. After the car attempted to drive away, residents blocked the path, and attempted to pull one of the volunteers out of the passenger window. This animosity stems from the belief that volunteers have created a rivalry between villagers and migrants. "They pit them against us," one villager said. "They come in and steal our food, our chickens, our dogs. What do you expect?!" The villagers did not always feel this way however. Until a recent string of vandalizations, the migrant-villager relationship was strong. This new found resentment was established over the last three months as the camps continue to be overcrowded. Migrants look on as one of the largest camps in Lesvos burns to the ground. The violence began early this morning with small incidents of rock throwing and trash burning, but quickly worsened as the day went on. According to several South African refugees, the massive blaze was started due to a conflict between a group of Afghans and the police. The animosity amongst neighboring ethnicities was also said to be a factor. You can't put these men who's countries hate each other in the same camps. It just doesn't work," said Moria resident Mike Abdule. The destruction displaced thousands of migrants who can now be found sleeping on the side of the road, the beach, or in what's left of their charred campsite.